Best things to do in Santorini | Elite Club, Ltd. This article was written on 29 Jul 2015. Mysterious island Santorini has its special charm. It is frequently called a “crown jewel of Greece” as the best travelling destinations are found there. 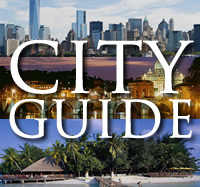 The place is loved by honeymoon couples die to its scenic views. What can be more romantic than dinner on the rim of the caldera? There are many restaurants that offer this for you in Santorini. Santorini is unique from geographical viewpoint as it was formed by a volcano. The volcanic explosions in Santorini over the course of thousands years created irregular contours of the landscape. Now we can observe incredibly beautiful nature with tightly packed little cubist homes. Flourishing cultural life around the volcano, which was one of the largest in the history of the planet, emphasizes man’s ability to survive despite harshness of nature. Black pebble Kamari beach and Red Beach are good reminders of volcanic activity on the island. Visit the cave house to enjoy unique Santorinian architecture and feel the spirit of the place. Many of them were turned into luxury resorts but all was different before. Poor people used to build the cave houses to be protected from severe ocean winds. Wine tours are exciting in Santorini as wine production dates back to the times of Roman empire. Centuries have passed but high quality wine is still produced there. Visit the lovely village of Emporio with lots of churches, historic architecture and ancient castle; and the prehistoric city Akrotiri, a Minoan city that was buried by volcano and now there is reconstruction work there. 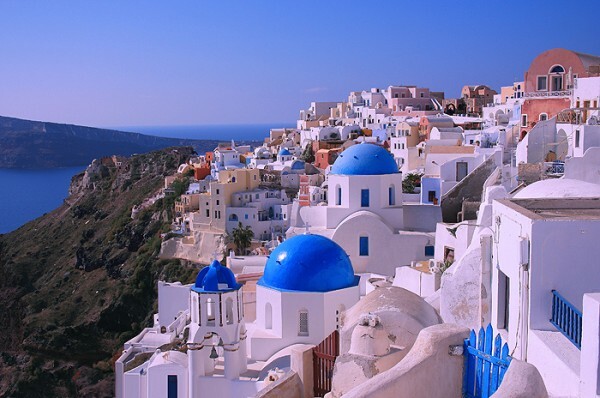 Oia village with beautiful whitewashed houses and blue shutters on top of the cliff attracts all tourists. It is actually the landmark of the island. Find the best sport for the sunset in Santorini. It is very spectacular in Fira, Firostefani and Imerovigli. You can look at it from different angles as long as you stay in Santorini. Sunset Villa Socrates or Sunset Villa Aristotelis with magical sunset views and etc. 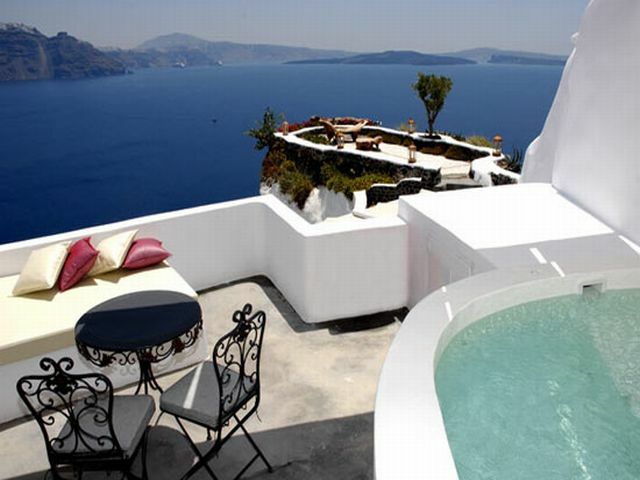 Andronis Luxury Suites look spectacular cascading down the side of Santorini. Its traditional Aegean architecture contributes to Mediterranean setting and provides unique, special feel. You will feel rejuvenated after Mare et Sanus Spa. The guests of the hotel are treated with local cheeses, fresh vegetables, and exquisite dishes of Greek cuisine with virgin olive oil, Greek herbs and succulent meats. Santorini is a great place where you can just walk in the maze of narrow streets among hospitable people and feel good at that.